Tamara Wasserman will be showing a painting entitled "WAITING"
This small canvas is an experiment in letting two realities coexist. It explores curiosity, lack of definition versus precision, hiding in order to reveal, the familiar and the unknown. Ellen Roth Deutsch is exhibiting drawings and beadwork as part of Focus 4: A Close Look at 4 Illinois Women Artists at the State of Illinois Museum, Chicago Gallery. In this exhibit, four curators picked an artist for separate gallery installations. 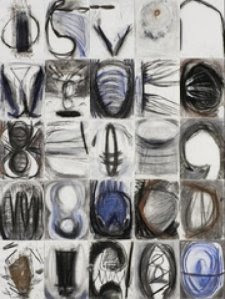 Deutsch will show drawings from Echoes of a Fragile Life and beaded organs from the Heartbeat collection. Reception: Friday, June 12, 5:30-7:30 pm. Ellen Roth Deutsch, who has a scientific background, will do a presentation on the connection between Dr. Gail H. Deutsch’s (her daughter) research on the fetal development of organs and the influence it had on the development of some of the beaded organ pieces in the Heartbeat collection. This presentation is sponsored by Science Chicago. 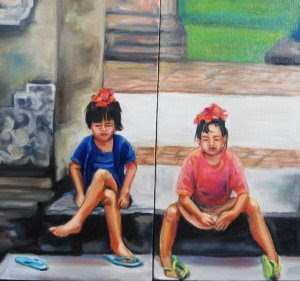 Tuesday, June 16, 7 p.m. – 9 p. m.
Artist Reception: Friday June 12, 2009 – 7:00- 9:00 p. m.
At left: "Flower Girls, Bali, Indonesia" oil on canvas, 14" x 22" diptych. Monday – Friday 9:00 a.m. – 9:00 p. m.
Saturday- 9:00 a. m. – 5 p. m.
Sunday – 1 p. m. – 5 p. m.
Algonquin artist Jeanine Hill-Soldner will exhibit her newest works consisting of colorful oil paintings depicting a portion of her world wide-travel experiences. Some of the travel destinations represent Bali, London, Paris, Italy, Germany, and Ireland. Many of the paintings are smaller than the artist’s signature large oil paintings. These colorful and inspiring paintings provide an intimate view of the world from an artist’s perspective. 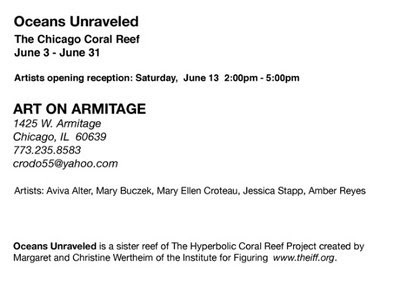 Opening Reception: May 1, 5:30pm – 8:30 pm. Ogilvie/Pertl Gallery is introducing two works by Ginny Sykes, Untitled in Twenty-five Parts and Homage to Oriana Fallaci, as part of their larger exhibition schedule. This work will also be included in an upcoming solo exhibition. Ogilvie/Pertl Galler435 E Illinois St. Hours: Wednesday-Saturday, 11 am – 6 pm; Sunday, 12 pm – 5 pm. Untitled in Twenty-Five Parts, 2008, Mixed media, 60" x 45"
Michele Williams announces her watercolor paintings and pins are now for sale on an ongoing basis at the Andersonville Galleria 5247 N. Clark and at Flourish Studios 3020 N. Lincoln Avenue in Lakeview. Michelle will be in a group Art Show at August House Gallery 2113 W. Roscoe in Roscoe Village May 3-17. A wine and cheese reception will be held from 1-5 pm on May 3 and 17. She will also be participating in the Art of the Library Show in the Columbia College Library at 624 S. Michigan 3rd floor through May 15th. Saturday, May 30 we will be singing at the Old Town School's Bob Dylan birthday bash. Saturday, July 11th at 5pm we will be singing at the Gazebo one block south of the OTS during their two day Folk and Roots Festival. Friday and Saturday, August 14 and 15 we will be singing at the Woodstock Festival concert at the OTS, additional performers at these events as well. Ruth Migdal's "La diva" has been chosen for the Lakefront sculpture Exhibit in Lincoln Park for one year. It is being fabricated in steel and will be 8' tall. Oakton College's Koehnline Museum has placed "Juno" a 7 1/2 foot tall bronze sculpture in an atrium at a new art section at their Skokie campus campus. Ruth will also have a a small bronze sculpture in an exhibit at Woman Made Gallery opening May 1st from 6 to 9 P.M.
Visit Ruth's new web site, RUTHAIZUSSMIGDAL.com and/or RUTHSCULPTURE.com. Ruth invites your feedback!